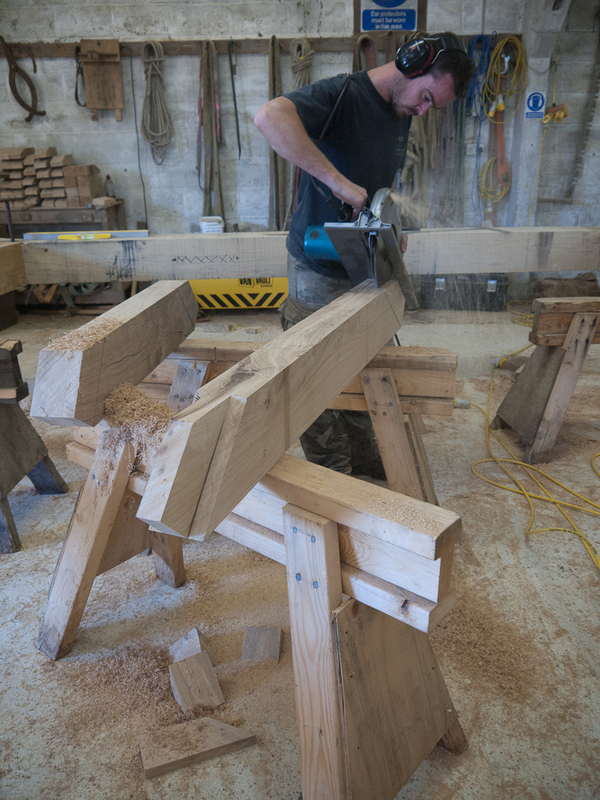 The story of the OneOak timber being used by Carpenter Oak & Woodland in preparing a frame for a new house was told in a previous post: OneOak timber framing the future. Earlier this week, OneOak project manager Gabriel Hemery, visited the site of the new house build in Gloucestershire. 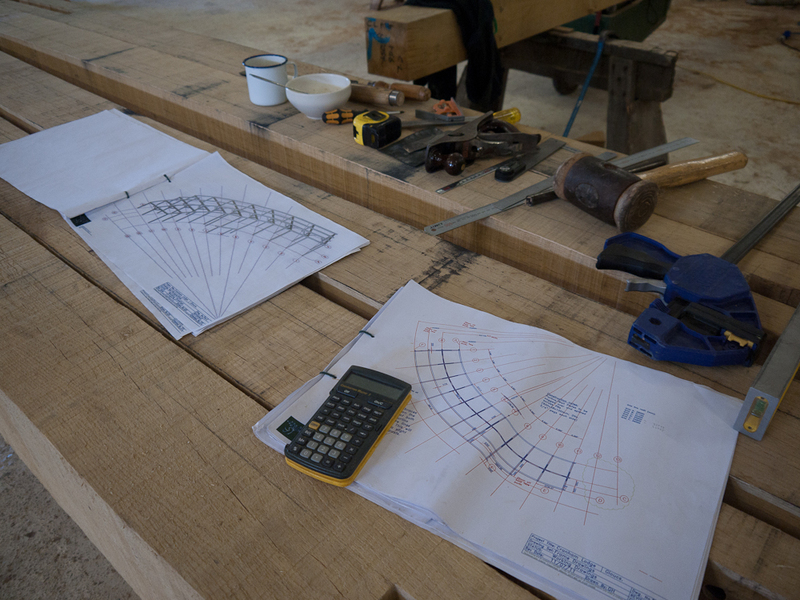 The timber frame of the stunning curved design, in which the OneOak braces form an integral part, was nearing completion. Workers from Carpenter Oak & Woodland were putting the final touches to the frame in readiness to hand it over to the builders to complete. This week one of the boards from the OneOak tree was delivered to Carpenter Oak & Woodland for use in an innovative new house build. 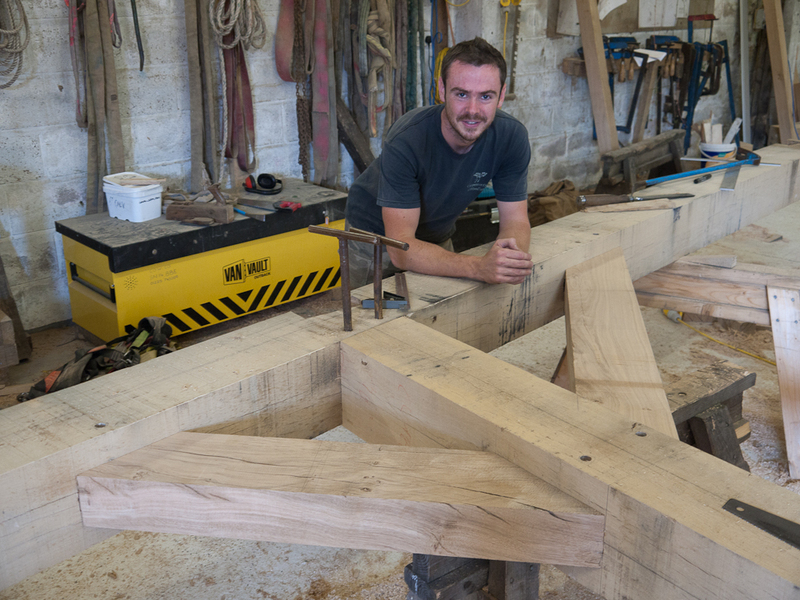 Project manager Gabriel Hemery went along to witness at first hand the creation of two timber braces and their installation in the oak frame. From the 22 boards milled from the OneOak tree at Deep in Wood sawmill 18 months ago, board 2.2 was selected for the timber framing project. This was a board 4350mm long× 670mm wide × 105mm thick, cut from the second length (4.5m to 9.0m up the tree stem). See more about this board and the others in our interactive online Sawn Timber Catalogue. 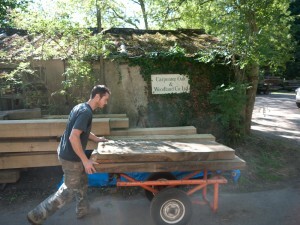 The OneOak board will be used in a large new build house in Gloucestershire. It consists of 13 mono-pitched cross frames set out on a curved grid. It is a complex, unusual and innovative architectural design. All the timber, other that our OneOak board, consists of oak imported from France: a total of 19 tonnes of oak. The timber frame is scheduled to be erected in late October. The OneOak board was destined to be used to create two timber braces about 1700mm and 1500mm long. Most of the frame had been constructed by the time our OneOak board was delivered. 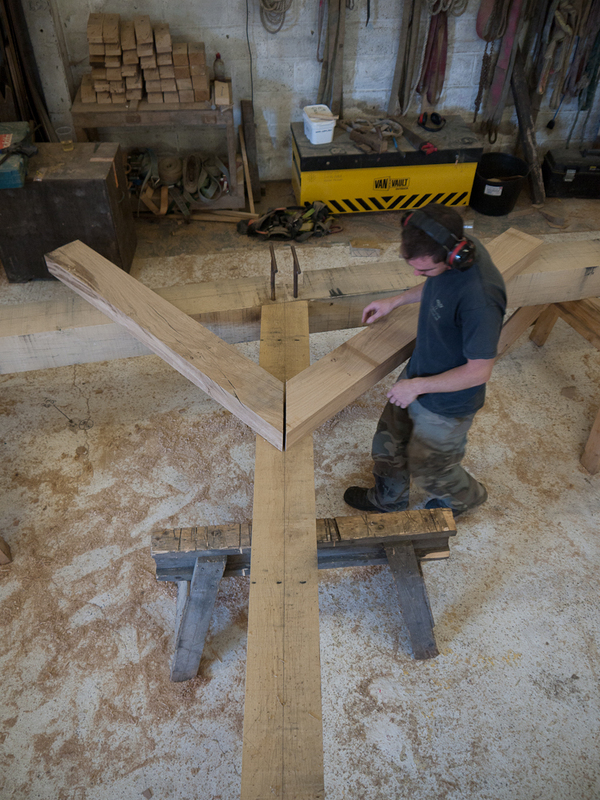 Assistant Team Leader at Carpenter Oak & Woodland, Matt Collins, first cut the two rough lengths to 175mm wide using a skill saw, squared them and planed them smooth with an electric planer. The two braces donated from the OneOak tree were only 18 months air-dried; normally the braces are dried for a minimum of five years. 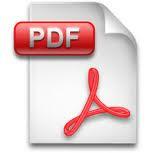 In this case however, the drying conditions at the sawmill produced timber that was sufficiently dry. The two braces complete and ready to test for fitting into the newly created mortices in the main frame. The completed cross section with the two OneOak braces in place. 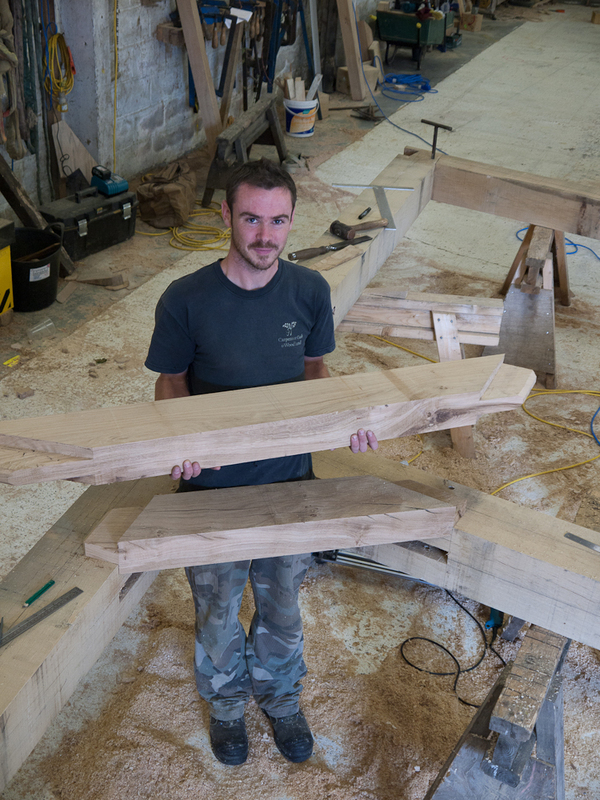 Carpenter Matt Collins has been timber framing for five years. The frame will be disassembled ready for transportation to the site of the new house build sometime in October. Typically the erection of a timber frame will take about one week on site. We look forward to witnessing the frame being erected and to posting more about it here in the future. Our thanks to all the team at Carpenter Oak & Woodland.